Chlorpheniramine is a first-generation antihistamine. It is used to treat allergic conditions such as rhinitis and Urticaria by reducing the effects of natural chemical histamine in the body. The medicines will help reduce the symptoms like watery eyes, itching, runny nose, sneezing etc caused by histamines like the common cold, flu, allergies etc. 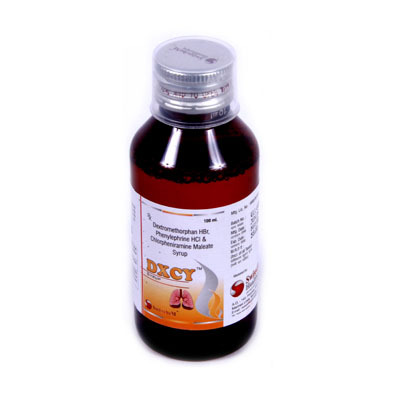 Dextromethorphan HBR (Dextromethorphan Hydrobromide) belongs to morphinan class with a sedative, dissociative, and stimulant properties. It is also an antihistamine used as a cough suppressant against itchy and watery eyes, sneezing, runny nose etc. Phenylephrine Hydrochloride is the hydrochloride salt form of Phenylephrine. It is a nasal decongestant with potent vasoconstrictor property. The medicines provide quick relief against allergies, hay fever and cold that causes nasal discomfort. Phenylephrine is vasopressors that decrease swelling of blood vessels in the nose.